Additional Description: Captions: (bottom left) Mortars fired shells at a high angle so they would fall on decks, penetrate and explode inside targeted ships. 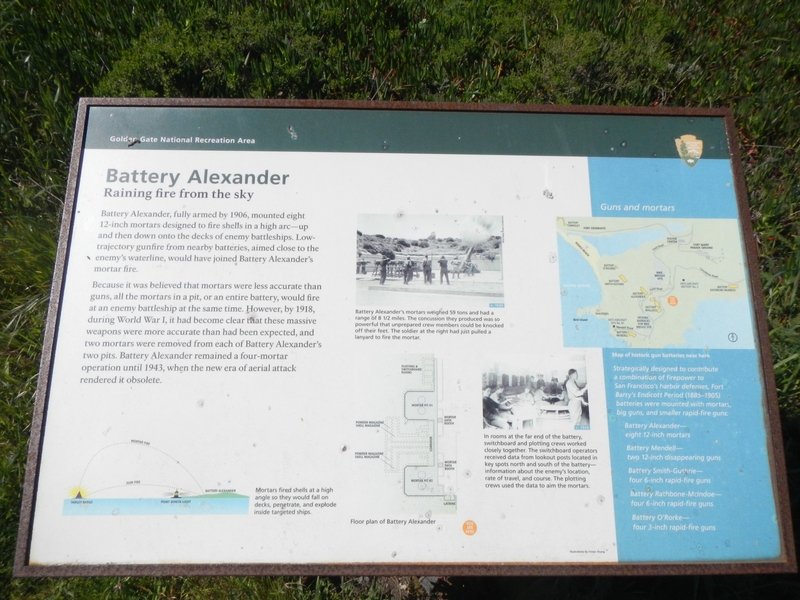 (top center) Battery Alexander's mortars weighed 59 tons and had a range of 8 1/2 miles. The concussion they produced was so powerful that unprepared crew members could be knocked off their feet. The soldier at the right had just pulled a lanyard to fire the mortar. (bottom center) Floor plan of Battery Alexander; In rooms at the far end of the battery, switchboard and plotting crews worked closely together. The switchboard operators received data from the lookout posts located in key spots north and south of the battery - information about the enemy's location, rate of travel, and course. The plotting crews used the data to aim the mortars. ; (right) Map of historic gun batteries near here. Strategically designed to contribute a combination of firepower to San Francisco's harbor defensed, Fort Barry's Endicott Period (1885-1903) batteries were mounted with mortars, big guns, and smaller rapid-fire guns: Battery Alexander - eight 12-inch mortars, Battery Mendell - two 12-inch disappearing guns, Battery Smith-Guthrie - four 6-inch rapid-fire guns, Battery Rathbone-McIndoe - four 6-inch rapid-fire guns, Battery O'Rorke - four 3-inch rapid-fire guns.